Today is Cinco de Mayo. As we eat our authentic tacos and sip on cold, tangy margaritas we aren’t necessarily thinking about what the day really stands for, which is a commemoration of the Mexican army's 1862 conquest over France at the Battle of Puebla during the Franco-Mexican War (are you asleep yet?). And that’s OK, because over time Cinco de Mayo has given Americans an excuse to do something even more stirring. We are warmly acknowledging and openheartedly embracing our neighbor’s rich heritage and culture. If you peel back the gritty layers and expose the country for what it really is, Mexico is brimming with history, celebration, and delicious food. I started this recipe thinking as every other food blogger thinks; I’m going to jump on the band wagon and make a Mexican recipe for a fun holiday. But as I researched how to make a delicious and authentic barbacoa, I was more intrigued by just how old this recipe really is. 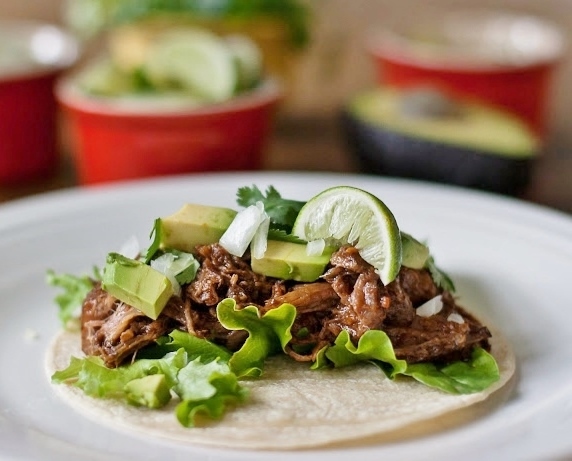 Experienced Mexican cooks have been passing down recipes for perfected barbacoa for over a thousand years. Its antiquity is as rich as the land, and I needed to do it service while making it easy for experimental home cooks like me to get authentic flavors with very little prep time. Although the prep is light, it still takes time to get the right texture and heat. 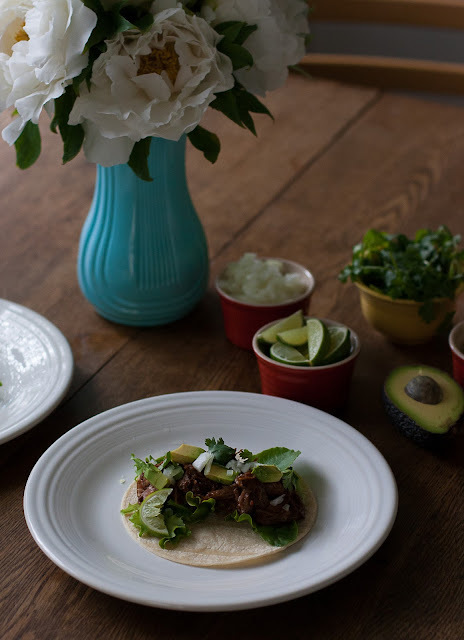 If you are having a party, make this at least a day ahead of time as barbacoa gets better with age. So after closing the lid and sliding your masterpiece in the oven, grab some tequila and have your own Cinco de Mayo celebration while the oven does the rest of the work. Everything worth eating takes time. You might as well get drunk while you wait. Amiright? In a blender, combine apple cider vinegar, garlic, cumin, oregano, charred poblano peppers (you can char them quickly on the stove top over an open flame with no oil), pinch of salt, cilantro, ground cloves, chipotle in adobo, and lime juice until thoroughly blended; set aside. Preheat vegetable oil in a large heavy pot with a lid to medium high heat. In batches, sear oxtail and cubed chuck roast until brown; reserve in a large bowl on the side. When all the meat has been browned, add chopped onion to the pot and cook until translucent; about five minutes. Return the seared meat with its juices to the pot. Cover in reserved sauce and add bay leaves and cinnamon stick; bring to a boil. Reduce heat to low, cover the pot and transfer to the preheated oven. Cook for 4-5 hours or until the meat shreds very easily with a fork. Remove bay leaves and cinnamon stick. With a slotted spoon remove all of the meat from the pot and transfer the meat to a large dish to cool slightly leaving behind only the sauce. Bring the sauce to a simmer, skimming the fat that rises from the top; allow it to reduce by half; about 10 minutes. With a for fork (or your hands) shred the meat, removing the bones and the fat as you go. Return the shredded meat to the sauce in the pot. Remove from heat, cover and cool to room temperature. Refrigerate overnight. Serve the next day by reheating as needed. Serve with corn fajita shells, avocado, minced white onion, fresh cilantro, salsa fresca, or anything else you love on your tacos! 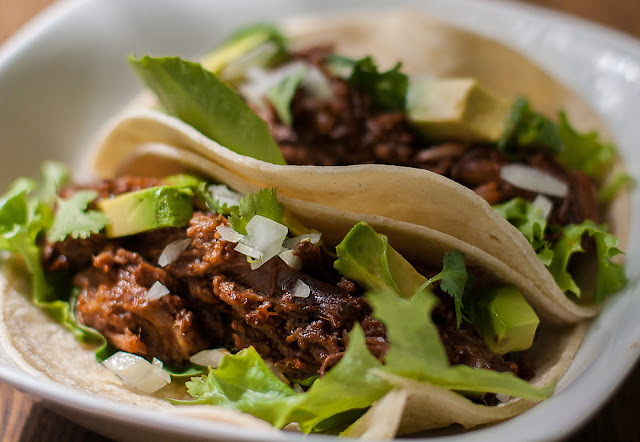 *Barbacoa gets better with age. Keep covered and cool for up to five days. Reheat and serve as needed. If you are serving it at a party, reheat the entire pot and garnish with fresh cilantro and tomatoes. Gorgeous presentation right in the pot! Thank you! the right light can certainly help where photos are concerned. This recipe is a crowd pleaser, and I know it seems like a lot of spice. But the spice mellows out the next day which is exactly why you need so much of it. I hope you try it! Bravo on the barbacoa! Amazing photos, and great lessons on Cinco de Mayo. And honestly, I just assumed what barbacoa was until this recipe. Thanks! Thank you! It's one of those recipes that inspires a party, that is for sure! The oxtail is really just a flavor enhancer. As the meat stews, the bones give it that much more flavor! You'll have to try it! I can imagine how deep and rich the flavours were after the long slow cooking. Love the seasonings that went in. I think this dish will go well with rice or potatoes also. Sounds good-) I love the idea of grab some tequila-) It is fun cook and drink together and cerebrate beautiful holidays! What a perfect Cinco de Mayo dish! I am mexican & I was looking for a good barbacoa recipe. I'm going to give this a try today. Btw....what are corn fajita shells?